Dave's Hot Nuts , a staple in my house! Always great service and I appreciate specials occasionally for free shipping ! I'll be back! I buy these for my son and he just loves them. Dave's Burning Nuts were awesome. Great flavor and hot! So good, it's hard to stop eating. These things are addicting. Share your nuts with your friends!! I am on my third container. These nuts have a kick that I found surprising, and I just love sharing them with my friends. Everyone is surprised by that first bite. 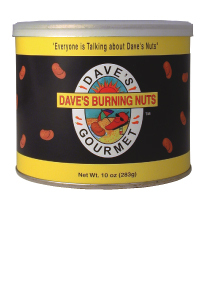 If you like hot nuts then Dave's Burners are what you have been looking for.